Via the extensive supplements we find on DVDs and through other methods, today’s film fans are much more conversant in movie-making methods than ever happened in the past. It didn’t used to be that way, and for many years, folks knew little about the methods uses to create flicks. Ever the pioneer, Walt Disney actually did his best to educate people about the realities behind the art of his cartoons and animated films, and we find some of those efforts collected on Behind the Scenes at the Walt Disney Studios. Last 2001’s Disneyland USA, this 2002 release includes a few different programs that all match the package’s theme. Whereas the former related shows that depicted the early years of Disneyland, Studios takes us behind the scenes and gives us a glimpse of how Walt and his cohorts created their magic. Studios offers six separate programs over its two DVDs. Actually, two of the ones found on disc one essentially provide the same piece. Filmed in July, 1937, A Trip Through Walt Disney Studios came about because the film distributors affiliated with RKO wanted to know more about how Disney made animated shorts. The 12-minute and 19-second featurette leads us through a basic overview of the processes. We hear about the rudiments and catch short looks at elements used for some shorts as well as Disney’s big gamble, Snow White and the Seven Dwarfs. To my moderate surprise, Trip provides a rather meaty overview of the creation process. It would seem fun even if it appeared puffy and insubstantial, as it’s cool to see so many legendary filmmakers in action. However, the coverage really works quite well and gives us solid information about animation. Despite its brief running time, Trip works well. After Trip enjoyed a positive reception from its audience, Disney decided to release it to the general public with a few modifications. Retitled How Walt Disney Cartoons Are Made, this version lasts eight minutes, 32 seconds, and places a much heavier emphasis on Snow White. Essentially intended to promote that movie in early 1938, Made presents much of the same material, though some new narration exists, such as the reference to the “pretty girls” who work on the cartoons. Made also presents some shots from the Snow White premiere as well as a few of that film’s promotional efforts. The Snow White moments mean that Made merits a look as a historical curiosity, but it doesn’t present its information as briskly or vividly as does Trip. Back when we first created our page devoted to Disney animation, I indicated on it that a DVD release of The Reluctant Dragon seemed unlikely to ever occur. Disney had never offered it for wide sale; as far as I can tell, the only US video release of the entire full-length film came via a three-tape VHS set a few years ago. The roughly 15-minute short entitled “The Reluctant Dragon” showed up in various compilations, but Disney demonstrated no eagerness to put out the entire film. I was wrong. As part of Scenes, we indeed find the original 73-minute and 30-second Dragon. An interesting blend of fact and fancy, Dragon starts at the home of humorist Robert Benchley. Is pushy wife insists that a story called “The Reluctant Dragon” could turn into a wonderful Disney cartoon, and she orders him to pitch the idea to Walt. Unenthusiastically, Benchley does so, and we watch as he tours the lot while he slowly finds his way to Walt’s office. This method features a lot of comedic acting along with the information. A vaguely fascistic studio guide (Buddy Pepper) pesters Benchley, and the humorist constantly tries to escape from this menace. Benchley encounters lots of actors who pretend to be studio workers – including Alan Ladd – and he even meets a few real artists along the way. Mostly they poke fun at him, which he good-naturedly accepts. Whether Benchley meets real Disney staff or fakers, Dragon maintains a fairly low level of real information. Oh, it does provide general facts about the creation of cartoons, but you’ll find clearer explanations elsewhere. Heck, Trip offers a stronger basic examination of the processes despite the fact that it runs barely one-sixth the length of Dragon! However, don’t take that as a slam on Dragon per se. It compensates for its lack of hard data with a nicely entertaining exploration of the studios. We do get a good view of the lot, and we see some solid material created specifically for Dragon. In addition to a segment in which drawings of Donald Duck come to life to explain animation and a piece with Casey Junior to demonstrate sound recording, the film includes three full shorts that appear nowhere else. Goofy’s “How to Ride a Horse” seems like the least compelling of the three. It’s very similar to about a million other Goofy cartoons, and it does little for me. The other two appear substantially more interesting. “Baby Weems” provides an innovative experience. This tale of a preternaturally sophisticated newborn tells the story all through still drawings and narration. That may sound like a cheap way to create a cartoon, and it is, but “Weems” uses the format to make the short more inventive and involving than it might have been through normal methods. The film’s centerpiece, “The Reluctant Dragon” offers a longer than normal short, as it runs about 15 minutes. A warm and funny story, “Dragon” provides a very solid offering as a whole. It doesn’t reinvent the wheel ala “Weems”, but it still stands as one of Disney’s stronger shorts, and it caps the movie nicely. Again, Dragon lacks much substantial information about the Studio, but it remains fun and amusing. 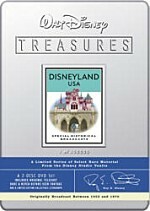 On DVD Two, we encounter three Disneyland TV programs from the Fifties. Each of them deals with the creation of animation in some way. Up first, The Story of the Animated Drawing runs 49 minutes and 14 seconds as Walt tells us the history of the genre. He goes back over very primitive efforts from thousands of years ago and starts to pick up steam when he gets to the 19th century, when basic animation went commercial. We get a segment that covers Emile Reynaud and his “theatre optique” and progress to 1906 with J. Stuart Blackton’s “Humorous Phases of Funny Faces”, which was apparently the first animated film. An actor recreates Winsor McCay “Gertie the Dinosaur” presentation, and we learn of J.R. Bray, who invented the basic patents for animation and ran an early successful studio. Though actors appear for most of these men, we actually meet Oliver Wallace, the first to accompany silent movies with organ music. The Disney folks do him up in makeup to get him to look younger and he then shows us what he did. After that, Story mostly becomes about Disney and it turns into a clip show. Walt tells us a little about seminal shorts like “Steamboat Willie” and “The Skeleton Dance” and we see snippets of other Disney efforts. A long segment from Fantasia’s version of “The Nutcracker Suite” finishes the program. Of the three pieces on DVD Two, Story seems like the least interesting of the batch. Walt’s attempts to cover animation history do provide some useful notes, but these segments move slowly, and the second half of the show comes across like little more than Disney promotion. Story merits a look for historical value, but it doesn’t provide a terribly compelling piece. Things improve somewhat with the next show, The Plausible Impossible. This 49-minute and 21-second program works around the hypothesis that even the most absurd cartoon actions need to have some basis in reality to work. For example, Walt demonstrates that there exists a physiological way for a cowbell to ring if you pull the cow’s tale, so that gag seems less ridiculous than it otherwise might be. Impossible occasionally feels like another excuse for a series of Disney clips. However, some good moments do emerge. One depicts Donald as he comes to life on Walt’s desktop, and the boss tortures the poor fowl to illustrate his points. We also see deleted segments from Snow White; these appear in rough pencil form, and Walt provides some decent notes about them. One of the show’s better segments depicts the interaction of music and film. Walt cues up a few different scenes from Fantasia as well as one from Bambi and runs “Night on Bald Mountain” from the former flick as an alternate soundtrack for these segments. This allows us to see how they’d work with the music. The program finishes with the actual scene from Fantasia. Though a little heavy on simple movie clips, Impossible nonetheless offers some good observations and demonstrations. Saving the best for last, Tricks of Our Trade also runs 49 minutes and 21 seconds as it lets us watch many animation secrets. Actually, most of these don’t seem very secret. Disney DVD fans will have seen many parts of Trade elsewhere, as it’s been excerpted repeatedly. Despite that case of déjà vu, I enjoyed the opportunity to watch Trade in its entirety. It leads us through many different facets of the animation process. Artists inspect slow-motion film segments to learn how to bring realism to their work; these parts offer shots of a dancing fat man as well as the splash of a drop of water and bubbles created to simulate boiling lava. We watch examples of how live-action reference models pose and move for the artists, and we also see a demonstration of the multi-plane camera. For that segment, some new Mickey animation illustrates how flat traditional shots can look. Trade indulges in some politically incorrect humor at times – especially when the animators laugh at the fat man – but it packs a lot of great information. There’s a reason we see its excerpts elsewhere – it presents the material efficiently and cleanly. It’s also great to watch well-known Disney talents like Ollie Johnston, Marc Davis, Milt Kahl, and Frank Thomas as they poorly deliver their scripted lines. Of course, Trade still features a lot of movie clips, but overall, the show seems quite entertaining and informative. As a whole, I’d say the same about Behind the Scenes at the Walt Disney Studios. These six programs don’t provide an excellent tutelage in how to make cartoons; if that’s all you want, you’d be better off with a couple of Disney’s excellent special editions, as they offer scads of information on the subject. However, these programs do offer a lot of useful material, and more importantly, they give us a fun look at Disney circa the Thirties through the Fifties. They allow us to watch the studio during its golden years and they present a lot of compelling work along the way. No Disney buff will want to skip Behind the Scenes. Behind the Scenes at the Walt Disney Studios appears in an aspect ratio of 1.33:1 on these single-sided, double-layered DVDs; due to those dimensions, the image has not been enhanced for 16X9 televisions. As one might expect, the materials presented a mix of issues mostly related to their age, but the programs seemed reasonably attractive when I took that factor into account. Both A Trip Through Walt Disney Studios and How Animated Cartoons Are Made presented very similar visuals. The black and white featurettes demonstrated fairly solid sharpness and accuracy, and they suffered from no signs of jagged edges, moiré effects, or edge enhancement. Black levels came across as acceptably deep and dense, while shadow detail was appropriately heavy but not too thick. Unfortunately, these two pieces suffered from quite a lot of source flaws. They displayed a lot of grain and I also saw many examples of specks, grit, spots, thin lines, and other issues. However, I expected these sorts of problems for the two featurettes due to their age and obscurity, so I generally felt pleased with their appearances. The image of The Reluctant Dragon seemed more disappointing, however. While not one of Disney’s major film releases, it remains part of their canon nonetheless, and most of those entries look substantially better than it does. Dragon usually looked fairly distinct and crisp, but the picture could come across as somewhat fuzzy and ill defined at times. This seemed most apparently during the film’s two main animated shorts. The softness didn’t cause extreme concerns, but I felt the picture should have seemed more detailed. The first 25 minutes of Dragon appeared in black and white; the movie went to full color after that point. The hues tended to look somewhat drab and messy. They presented acceptable tones at times, but they lacked the vivacity and vibrancy that I’d expect, and they generally seemed moderately lackluster. Black levels remained reasonably deep, however, and shadows were acceptably defined most of the time. However, some low-light sequences could be a bit dense, and the contrast seemed somewhat flat. Print flaws popped up regularly throughout Dragon. Though not to the severity seen on the other DVD One programs, Dragon displayed a mix of speckles, grit, grain, scratches, marks, spots, dust, and streaks. No part of the movie featured them more prevalently than others, as even the film’s centerpiece – the “Dragon” short itself – suffered from the same concerns. Objectively, Dragon looked pretty good for a more than 60-year-old flick, but it didn’t match up to Disney’s usual standards. 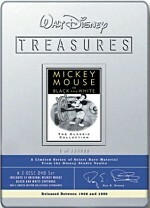 The three programs on DVD Two came from episodes of the Disneyland TV series. The first appeared only in black and white, whereas the other two mostly featured color. The Story of the Animated Drawing tended to look somewhat soft and flat, and it presented a fairly drab image. Despite decently dark blacks, contrast favored the gray side of the scale and looked a bit mushy. The program also presented a fair number of speckles and marks. Interestingly, Story suffered from the heaviest amount of flaws during the sequence devoted to Emile Reynaud, which made me wonder if those were intentional to give the segment an “old time” appearance. Totally in color except for its opening and closing credits, The Plausible Impossible presented the strongest image of the three Disneyland shows, mostly due to the relative lack of print flaws. As with Story, Impossible also demonstrated a moderately soft look at times, and it showed some noticeable edge enhancement as well. The colors tended to look rather brownish and drab, as they didn’t display much life or spark. However, Impossible included fewer defects than any of the other pieces. While it still offered some grain, grit, speckles, marks and streaks, these remained relatively minor. The show never looked particularly good, but it seemed superior to its package mates. Tricks of Our Trade mostly resembled Impossible, but it suffered from some heightened concerns. It also used color except for the opening and closing credits. The hues generally maintained the same brownish tint seen in Impossible, but a few scenes featured unusual tones. For example, at one point during the effects animation discussion, the screen favored blues rather heavily. Trade also suffered from elevated levels of print flaws when compared to Impossible, especially in regard to graininess. It became hard to grade Studios because of the variations among the films. They spanned a period of decades and I also had different expectations for their quality. I clearly anticipate that a full-length film release like The Reluctant Dragon should demonstrate better visuals than an obscure promotional featurette or a TV show. Ultimately, that made Dragon the only real disappointment among the six segments of Studios. In the end, I felt that a “C-“ seemed apt for this collection as a whole. All six segments of Behind the Scenes at the Walt Disney Studios featured monaural sound, but they also displayed some variations. Unsurprisingly, the sister productions Trip and Made presented the weakest audio. Scratchy and rough, those featurettes always remained acceptably intelligible, but they showed moderate pops and noise and seemed like the least pleasing of the different pieces. As the most significant production of the six, I again maintained the highest expectations for Dragon. In regard to its audio, Dragon appeared adequate. Speech displayed slight edginess at times and could come across as a bit trebly, but the line always seemed acceptably distinct and intelligible. Effects and music seemed thin and tinny but they were clear and lacked any substantial distortion or flaws. Dynamic range was limited as one might expect of a more than 60-year-old soundtrack. I noticed some light hiss and pops and noise on occasion, but overall the mix sounded fairly clean. In regard to the three Disneyland TV productions, they presented generally similar audio. Speech appeared somewhat stiff and flat but always remained intelligible and relatively free from roughness. Music could come across as a bit distorted at times, but the tunes usually sounded moderately bright and bouncy. Effects also were slightly harsh from time to time, but generally they appeared fairly clean and accurate. These shows also failed to deliver much bass response, but they also suffered from few instances of background noise. I felt that the different audio tracks of the six programs that make up Behind the Scenes at the Walt Disney Studios appeared quite average for their age, so I gave the set a “C” in that domain. 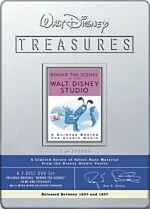 We get a nice roster of supplements spread across the two DVDs of Behind the Scenes at the Walt Disney Studios. The disc opens with an introduction from film historian Leonard Maltin. In this 73-second clip, Maltin discusses Walt as a public figure and sets up the background of the program. Maltin also provides introductions for each of DVD One’s three features. In his 135-second snippet prior to Trip, he explains the film’s origins and also helps identify some of the Disney Studios talent we’ll see. For Made, Maltin offers a 119-second discussion of how it came to into being and the ways it differs with Trip. His most substantial intro, the four-minute and 51-second clip before Dragon also covers the project’s genesis as well as its reception, the identities of some actors who pretended to be Disney Studio talent, and a few other topics. One cool feature appears along with Trip. You can watch that film with or without an Informational Subtitle Track. This identifies locations, the filmmakers we see, and the shorts they create. It adds a useful layer of information that makes it enjoyable. Next we find a new featurette called Leonard Maltin’s Studio Tour. This 24-minute and three-second piece provides a quick history of the Disney Studios while it moves through various locations and buildings. It traces the expansions and moves of Disney Studios over the years and ends with a vintage first-person film clip that travels through the lot; the latter feels much like a Disneyland attraction. “Tour” seems slightly dull but it provides some good notes that don’t appear elsewhere in this set, so fans will want to give it a look. For Behind the Boards on Baby Weems, Maltin interviews long-time Disney storyman Joe Grant. A reluctant participant, Grant chats with Maltin for five minutes, 50 seconds. They cover the genesis of the “Weems” short and Grant’s involvement in the film. Grant indeed seems somewhat uncomfortable as he discusses his past, but the segment features some nice material that makes it worthwhile. DVD One finishes with two sets of stillframe packages. The Reluctant Dragon Gallery includes 45 black and white photos from the movie, while the Walt Disney Studios Gallery provides 13 shots. In the latter area, three of the stills include audio information from Maltin, who gives us basic comments about the Studio. Like many Disney DVDs, Studios opens with an ad. 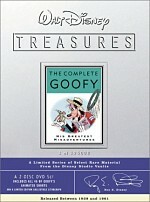 This one touts the “Disney Treasures” line. Oddly, however, it touts last year’s four releases and doesn’t mention the 2002 batch. When we shift to DVD Two, we locate a mix of additional supplements. The platter opens with a new 56-second introduction from Maltin. He briefly goes over this disc’s programs as well as some remarks about Walt’s willingness to discuss his past. As with Disc One, each of this DVD’s three shows begins with additional Maltin introductions. These last between 98 seconds and two minutes, 33 seconds, and all cover similar territory. Maltin simply provides general overviews for each program. An interesting archival piece, the Tour of the Disney Studio radio program offers a surprisingly compelling bit of audio from the late Forties. Recorded for Australian listeners, this one goes through the Studio and gives us a general look at the creation of the films. It includes little that sheds much light on the process that we don’t find elsewhere, but it seems tight and nicely factual. It reveals interesting tidbits as well; for example, at the time, Walt planned to make Alice In Wonderland as a hybrid live-action/animated film ala his early “Alice” comedies. This radio show definitely merits a listen. The Kem Weber Gallery includes architectural designs for the Studio. Presented in the stillframe format, we get 36 of these. The first one features an optional audio track from Maltin, who offers a fairly lengthy biography of the designer. Finally, the DVD’s booklet includes a short text overview of the set from Maltin as well as some archival images. A consistently entertaining package of programs, Behind the Scenes at the Walt Disney Studios doesn’t provide the best education in the creation of animation. However, it nicely mixes informative segments with entertainment and offers a charming look at Disney Studios in their glory years. The DVD’s picture generally looks fine for the age of the material, though The Reluctant Dragon seems less vivid and distinct than I expected. Audio quality also appeared average for the era, and the set includes a small but useful roster of extras. As with other specialized pieces like Disneyland USA, I don’t know how much interest Behind the Scenes will hold for casual Disney fans, but more heavily involved parties should definitely enjoy it.